This raises some interesting meta-questions, since the clip presumably takes place in some reality between ours and the one on the BoJack TV show. After all, BoJack Horseman isn’t a real person in our reality and he doesn’t have a Netflix show in the cartoon reality, but maybe we’re just overthinking this. 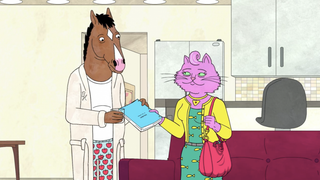 Either way, BoJack Horseman will come back for a fifth season of wacky, pun-filled adventures that are also occasionally soul-crushing and/or uplifting at some point in the future.